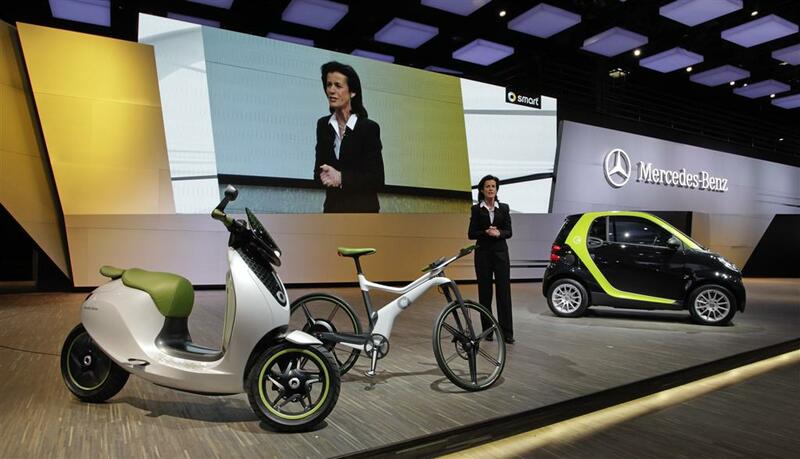 German car maker Mercedes Benz is on a path to electrification of it’s vehicles. To tap in to the market of hundreds of millions of scooters in Europe that will require electrification on short term, they have developed a high quality electric smart scooter that will be sold by its subsidiary car brand Smart. 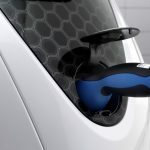 The Smart Escooter translates the characteristic advantages of the pioneering Smart fortwo electric drive e-car into a two-wheeler: compact dimensions, agility, high safety standards and the driving fun typical of the smart brand, not least backed by an high performance 4kW (~150nm) efficient and locally emission-free electric motor. Instead of a regular dashboard, the Smart Escooter offers a smart phone dock combined with a smart drive kit phone app that has versatile functions such as those of a speedometer or range indicator. 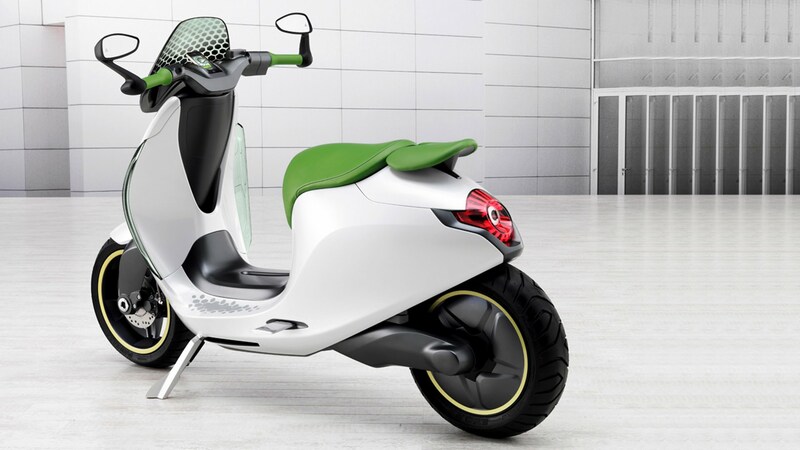 Before starting the electric scooter, the rider needs to place the smartphone in a specially-designed mount in the centre of the handlebars which will unlock the immobiliser and anti-theft protection, allowing the electric scooter to be started. The Smart Drive Kit app allows the rider to use online services when making stops on the road. During the journey, the smartphone serves as the scooter’s speedometer. 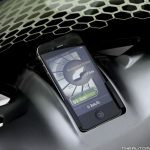 It also displays the range and battery charge level and acts as a navigation system. “GPS Tracking” enables to remotely track the position of the scooter so that it is possible to find where it is parked. The handlebars provide in heating for comfort in the winter. 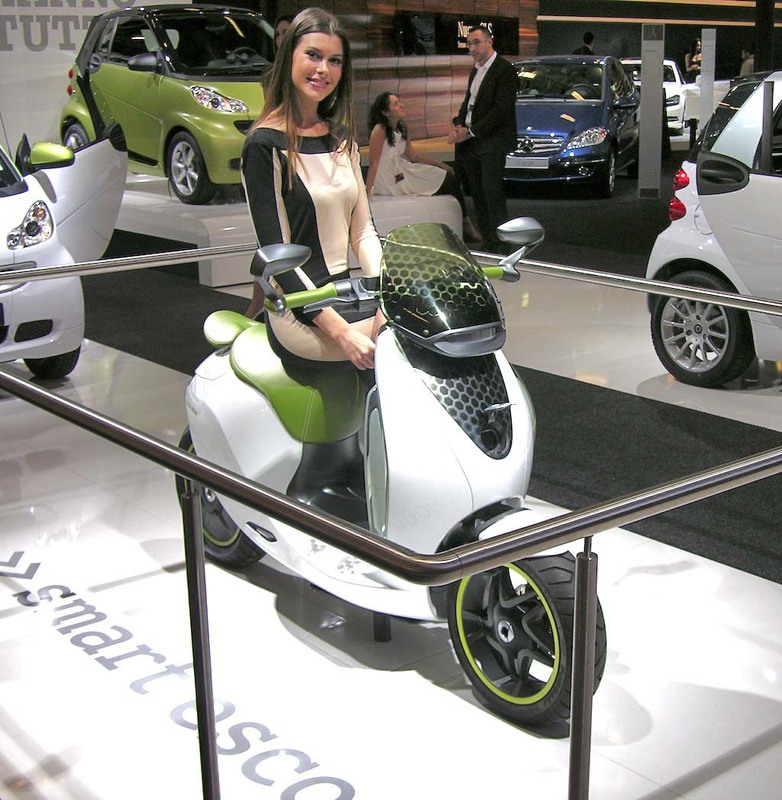 The electric scooter’s supporting chassis structure is consciously modelled on the tridion safety cell of the Smart Fortwo e-car. Its aluminium frame is clad with fully interchangeable plastic bodypanels. This is another clear parallel to the successful two-seater. 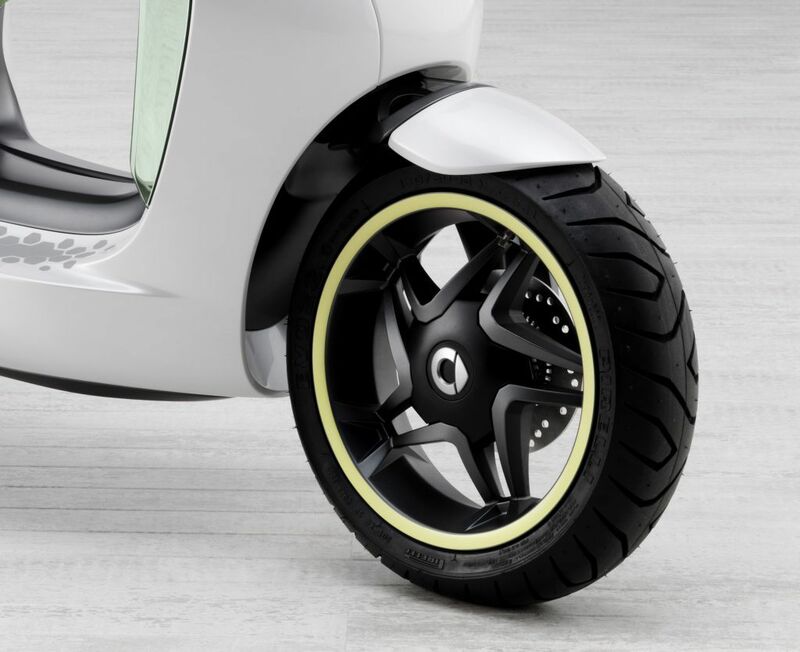 A further special feature of the Smart Escooter are the long, extensive and translucent elements on the edges of the foot protection (front panelling). These illuminated side markers improve visibility from the side, and also serve as striking indicators. The Smart Escooter guarantees distinguished impact in terms of “see and be seen” by means of state-of-the-art LED technology. 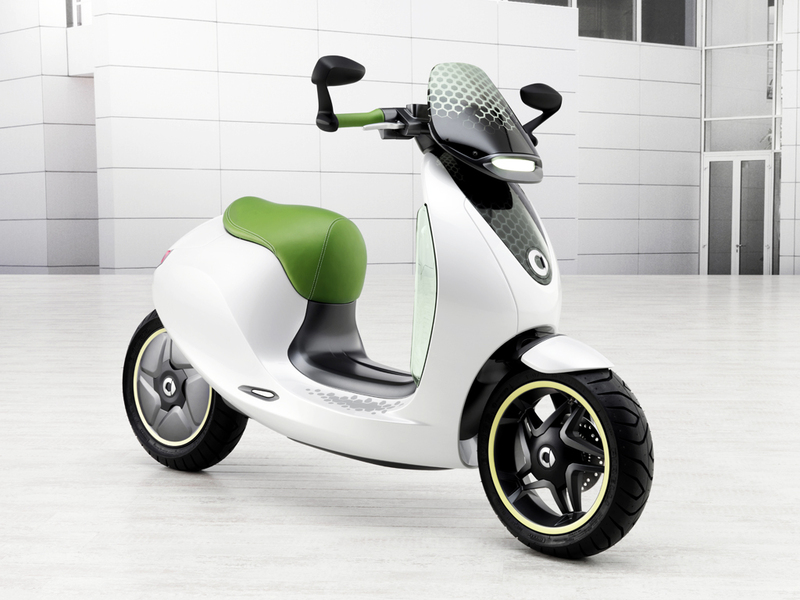 In addition to environmental sustainability, the Smart Escooter has a focus on driving fun: it is driven by a disc-shaped wheel hub motor in the rear wheel, which offers a powerful 4 kW despite its compact size. The brushless direct current hub drive transmits its power directly to the rear wheel, and is clean and maintenance-free. A further advantage: as the motor does not take up any space in the chassis, more stowage space is available there. As full torque is available right from the start, the scooter offers exceptional fast acceleration. At traffic lights, the Smart Escooter can easily outpace most cars. 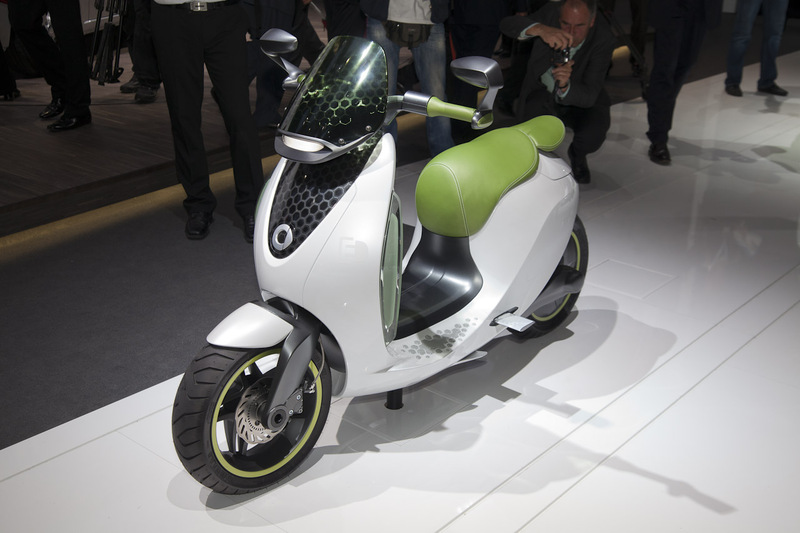 The Smart Escooter has a top speed of 45 km/h. The scooter contains a 80 Ah Lithium battery pack that provides a driving range of 100 km. The escooter can be charged at any standard household power socket within three hours. The charging socket is stored at the front of the scooter underneath a hinged smart emblem, while the charger itself is integrated in the scooter. The high energy efficiency of the Smart Escooter is further enhanced by solar cells at the front. The solar collectors charge the scooter when it is parked and while driving in the sun, enabling to increase the driving range and maintain a better battery health. 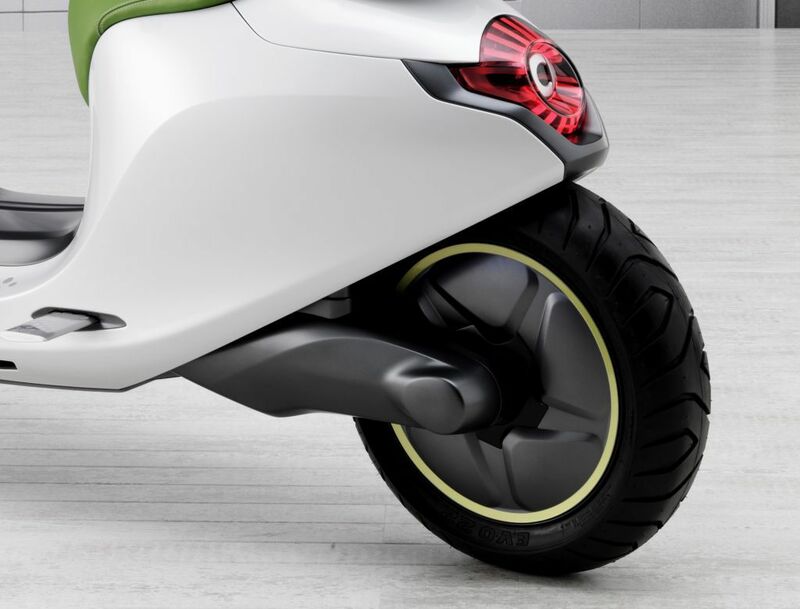 The Smart Escooter contains an advanced anti-lock braking system (ABS). To brake the scooter safely, just one touch suffices to retard both the front and rear wheel simultaneously. When the hydraulic disc brake at the front is actuated, an anti-lock braking system (ABS) kicks in to ensure maximum braking effect even during emergency braking. The rear wheel is braked in parallel to the front wheel, though not mechanically but electrically. This task is performed by the wheel hub motor in the rear wheel, which normally propels the scooter forwards. When the brakes are applied, the operating principle is reversed: the motor becomes a generator whose resistance provides the required braking effect. 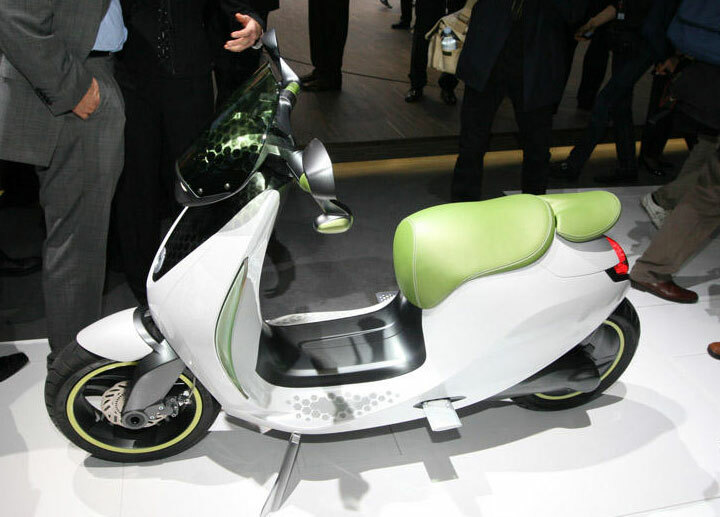 The resulting braking energy is converted into electrical energy and stored in the scooter’s lithium-ion battery.